The Milwaukee Brewers head to Citizens Bank Park on Sunday, July 23, 2017 to take on the Philadelphia Phillies. The expected starting pitchers are Junior Guerra for the Brewers and Jerad Eickhoff for the Phillies. The odds for this matchup have Milwaukee at +103 and Philadelphia at -113. The Brewers have a 49-46-4 over/under mark and a 56-43-0 run line record. The Phillies are 49-45-0 against the run line and have a 42-45-7 over/under record. The Brewers have a 52-47 overall record this season. Starting pitcher Junior Guerra has a 1-3 record with an earned run average of 4.77 and a WHIP of 1.50. He has 43 strikeouts over his 54.2 innings pitched and he's given up 50 hits. He allows 8.2 hits per 9 innings and he has a FIP of 7.11. The bullpen has an earned run average of 4.14 and they have given up 323 base hits on the year. Teams are hitting .245 against the bullpen and they've struck out 347 hitters and walked 168 batters. As a team, Milwaukee allows 8.8 hits per nine innings while striking out 8.1 batters per nine innings. They are 9th in the league in team earned run average at 4.06. The Brewers pitchers collectively have given up 856 base hits and 397 earned runs. They have allowed 116 home runs this season, ranking them 16th in the league. Milwaukee as a pitching staff has walked 338 batters and struck out 793. They have walked 3.5 men per 9 innings while striking out 8.1 per 9. They have a team WHIP of 1.36 and their FIP as a unit is 4.33. As a team Milwaukee is hitting .254, good for 18th in the league. The Brewers hold a .446 team slugging percentage and an on-base percentage of .325, which is good for 17th in baseball. They rank 16th in MLB with 8.7 hits per game. Orlando Arcia is hitting .282 with an on-base percentage of .323. He has 91 hits this season in 323 at bats with 35 runs batted in. He has a slugging percentage of .415 and an OPS+ of 89. Domingo Santana is hitting .290 this year and he has an on-base percentage of .381. He has totaled 93 hits and he has driven in 51 men in 321 at bats. His OPS+ is 126 while his slugging percentage is at .502. 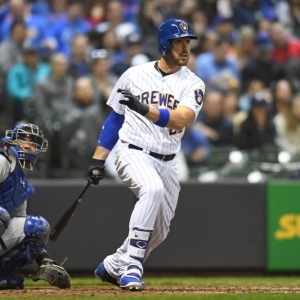 The Brewers have 851 hits, including 176 doubles and 145 home runs. Milwaukee has walked 320 times so far this season and they have struck out 950 times as a unit. They have left 651 men on base and have a team OPS of .771. They score 4.84 runs per contest and have scored a total of 474 runs this year. Philadelphia has a 33-61 overall mark this year. With an earned run average of 4.83, Jerad Eickhoff has a 1-7 record and a 1.52 WHIP. He has 81 strikeouts over the 87.2 innings he's pitched. He's also given up 98 hits. He allows 10.1 hits per nine innings and his FIP stands at 4.33. The bullpen has an earned run average of 4.33 and they have given up 302 base hits on the year. Teams are hitting .251 against the Phillies bullpen. Their relievers have struck out 292 batters and walked 129 opposing hitters. As a team, Philadelphia allows 9.1 hits per nine innings while striking out 7.7 batters per nine innings. They are 19th in the league in team earned run average at 4.6. The Phillies pitchers as a team have surrendered 841 base knocks and 423 earned runs this season. They have given up 133 home runs this year, which ranks 6th in Major League Baseball. Philadelphia as a staff has walked 301 hitters and struck out 708 batters. They give up a walk 3.3 times per 9 innings while they strike out 7.7 per 9. Their team WHIP is 1.38 while their FIP as a staff is 4.72. As a team, they are batting .245, good for 22nd in the league. The Phillies hold a .399 team slugging percentage and an on-base percentage of .308, which is good for 27th in baseball. They rank 23rd in MLB with 8.4 hits per contest. Freddy Galvis comes into this matchup batting .251 with an OBP of .303. He has 87 hits this year along with 38 RBI in 346 AB's. He maintains a slugging percentage of .419 with an OPS+ of 89. Odubel Herrera is hitting .261 this season and he has an OBP of .302. He has collected 92 hits in 352 at bats while driving in 34 runs. He has an OPS+ of 89 and a slugging percentage of .418. The Phillies as a unit have 777 base hits, including 168 doubles and 94 homers. Philadelphia has walked 279 times this year and they have struck out on 801 occasions. They have had 607 men left on base and have an OPS of .707. They have scored 3.92 runs per game and totaled 365 runs this season. Who will win tonight's Brewers/Phillies MLB game against the spread?